Enjoy style and function when you come to our store for your next flooring purchase. Our company sells a wide range of options, including luxury vinyl tile which is growing in popularity with our customer base. We have numerous options in our showroom that include vinyl in styles that mimic the look of wood, natural stone, and tile. Once you make a purchase from our store, you can follow through and protect your investment with our vinyl flooring installation service. In a few short hours, we can transform your home with your brand new luxury vinyl tile. As one of the most popular flooring styles nationwide, luxury vinyl tile is gaining a hold on its place in the market for home and office flooring. We highly recommend this flooring style to customers that love the look of wood or natural stone but want to spend less time on maintenance. In addition, this option is durable for high-traffic areas such as kitchens, entryways, and even bonus rooms. Transforming your home starts with making the appropriate flooring choice for your space. We are experts in matching the right option with your personal design aesthetic as well as your budget. We carry styles that mimic the look of all species of trees, as well as planks of varying widths, just like real hardwood. Just like hardwood flooring has various finish options, so does LVT flooring. Some of the most popular types of species mimic the look of oak, maple, and walnut. Once you first walk into your home or office after vinyl flooring installation, you will immediately notice how transformational this update truly is for the spaces you have refreshed. This material is easy to keep clean because its layers can be cleaned quickly and effectively. Home and business owners don’t have to worry about constantly cleaning their flooring or choosing the right cleaning product when they purchase this valuable home update. Colors and patterns that are available with vinyl flooring are almost endless. Solid and composite vinyl can be put together to create many unique random patterns. Printed vinyl is much more versatile and will allow you to get the look of natural stone, hardwood types, or many other materials that you can think of. Mixing and matching material can make it look like you have combined a variety of elements in your floor. Vinyl flooring is quite easy to maintain. You should just make sure that sand, dirt and grit are kept swept free to avoid scratching on the surface of the floor. Using a damp mop and a vinyl floor cleaner approved by the manufacturer to remove stains is easy. Our company caters to customers shopping for luxury vinyl flooring. We are here to accommodate your purchase and make it possible for you to get exactly what you want and need. Aside from our most competitive pricing, we offer convenient financing options. 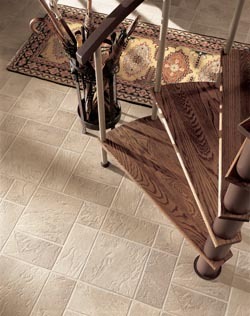 Enhance your property with vinyl tile or vinyl plank floors that add style, function, and beauty to any area or room. To find out more, simply call <PHONE>, or use the form to the right to reach us anytime you want! Learn more about the options of luxury vinyl flooring we have available in our showroom when you contact us today for more information. We are proud to serve clients in Bradenton, Sarasota, North Sarasota, and Palmetto, FL, and the surrounding communities.